Twitter today announced what it says is the biggest update to Vine for iOS yet, adding a slew of new features and fixing multiple issues. You can download the new app now directly from Apple’s App Store. First and foremost, the new app now has channels where you can submit posts or browse from the Explore screen; each has their own theme and Popular feed. As of today, there are 15 channels available: Comedy, Art & Experimental, Cats, Dogs, Family, Beauty & Fashion, Food, Health & Fitness, Nature, Music, News & Politics, Special FX, Sports, Urban and ‘wier d’. Next up is the new “On the rise” section that lets you discover new people “who are starting to capture the attention and interest of the Vine community.” In other words, it’s another place to check out trending users. Most interesting of all, however, is “revining.” Just like retweeting, you can now share other people’s posts with your all of your followers in one tap. Twitter has also redesigned the camera and included new grid, focus, and ghost tools. This is key for those who want to push the limits of producing great content on the platform. Last but not least, Vine now offers protected accounts. Although most posts are public (they can be viewed, discovered and shared by anyone on Vine), just like on Twitter, if you want more control over who can see your posts, you can now protect them. Again, just like on Twitter this means only the people you approve to follow can see them, unless you share them elsewhere. Channels: Browse or submit your posts to 15 new channels — from Comedy, Art & Experimental, to Cats, and more. 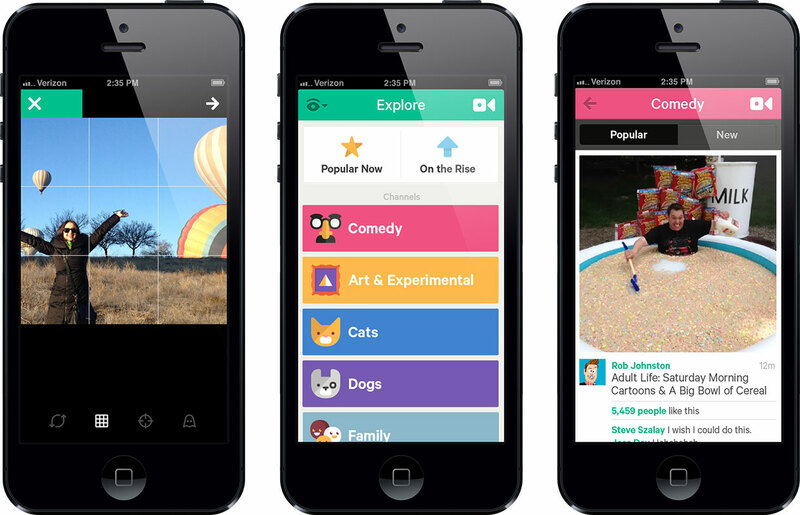 On the rise: Discover new and interesting Viners right from your Explore screen. Revining: Share your favorite posts with all your followers on Vine in one tap. New capture tools: Shoot with style using the new focus, grid, and ghost tools. Protected accounts: Allow only people you approve to follow you and view your posts. Fixed an issue that caused the camera to focus unnecessarily while recording. Improved cache control and less disk space usage. Faster search for hashtags and people you mention frequently. Crash fixes and other miscellaneous improvements. While these new features are available now on iOS, Twitter says protected posts will also be available in an Android update later today. All the other features will arrive for Android next week.